On Friday, November 17, 2017 the SCID Angels family lost one of our own. Board of Trustees member, Barbara Ballard and her SCID son, Ray Ballard, lost their husband and father. Don was not only a volunteer and huge supporter of SCID Angels, he was a dear friend and will be greatly missed. He is now forever free of disease and pain and as he watches over his family here on earth, may they feel comforted to know they have a guardian angel watching over them. We feel honored that Don felt such a special bond with the SCID Angels community and that his family has requested memorial gifts be made to our foundation, in his memory. 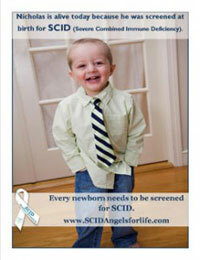 Please click on the donate button below to make a donation to SCID, Angels for Life Foundation in memory of Don Ballard. The family has asked to receive acknowledgment of all donations made. Please check the box to include your mailing address so it can be shared with the family only.